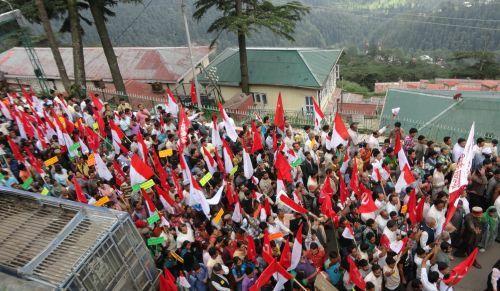 Newly floated Himachal Lok Morcha (HLM) organised a rally in Shimla today. 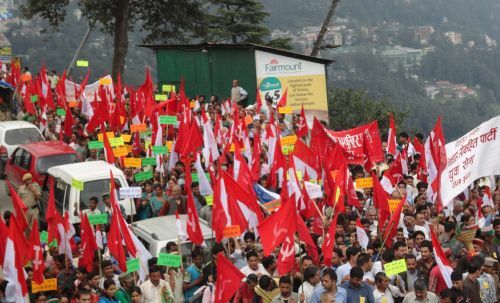 In the rally, about 10,000 activists from CPM, Himachal Lokhit party (HLP) and Himachal Gaurav Manch participated and addressed many general issues. The main motive of this rally was to highlight issues like unemployment, Health, Education, Agriculture and Horticulture and corruption in the BJP led Govt. 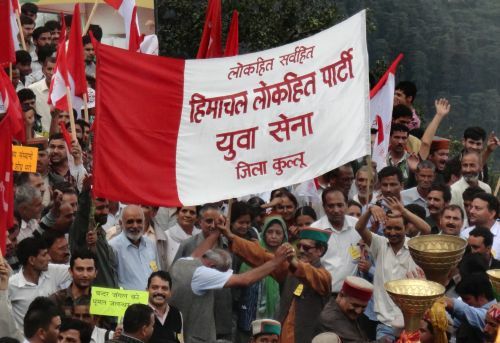 HLM leaders addressed its supporters at Chaura Maidan Shimla, where HLP convener Maheshwar Singh, HLP founder member Shyama Sharma, CPM leaders Rakesh Singha, Tikender Panwar, CPI leader Shashi Pandit, Himachal Gaurav Manch convener Dulo Ram and Desh Raj addressed the rally. All leaders criticised BJP lad Govt working and alleged that BJP has protected corrupt people and has given free hand to the outsiders in State. 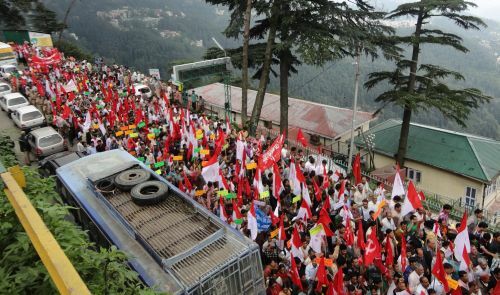 However, Shimla police stopped protestors, when they were going to submit their grievances to the Vidhan Sabha speaker and while trying to cross police barricade, Shimla police opened water cannon on the protesters. 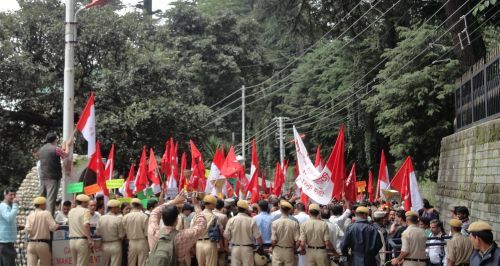 However it angered the agitators and they continued their protest and shouted slogan against the Dhumal Govt. 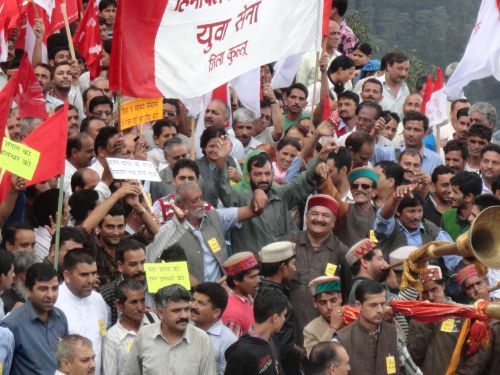 Himachal Lok Morcha workers alleged that they were protesting peacefully and on the behalf of BJP led Govt, police unlawfully acted against them. 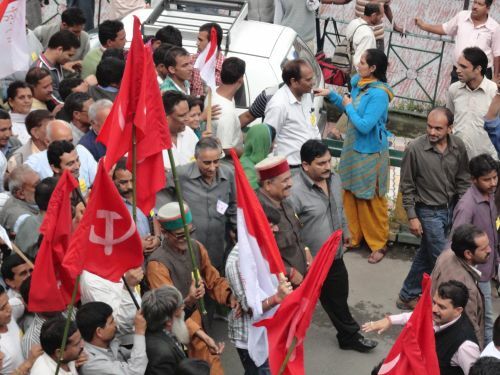 However later police arrested about 300 protesters including Maheshwar Singh, Shyama Sharma, Rakesh Singha, Tikender Panwar, Shashi Pandit, Dulo Ram, Desh Raj, Onkar Shad, MN Sofat, Kuldeep Singh Tanwar and send them to the various police station in shimla. Morcha leaders blame Govt for undemocratic and action against the HLM activists show its dictatorial attitude towards its opponent.